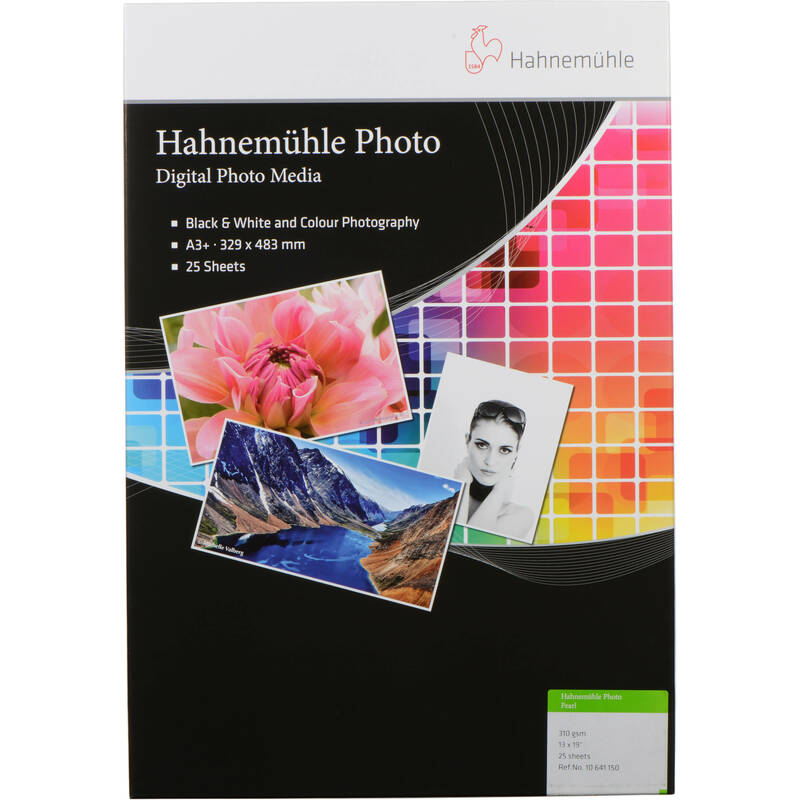 This 25-sheet pack of 13 x 19" Photo Pearl 310 Paper from Hahnemuhle provides users with a finely structured polyethylene-coated paper with an ink absorbing layer. This allows for high sharpness with deep black levels and a wide color gamut for vivid photographs. This paper also features a basis weight of 310 gsm and a thickness of 11.8 mil for a heavyweight feel, as well as an opacity of >95%, a whiteness of 105%, and a gloss value of 25% at 60° due to the pearl surface finish. Additionally, it is quick drying and resistant to water, scratches, and fingerprints. Box Dimensions (LxWxH) 19.5 x 13.4 x 0.7"
Photo Pearl 310 Paper (13 x 19", 25 Sheets) is rated 4.0 out of 5 by 3. Rated 3 out of 5 by Francesca from Still Deciding Of course it prints beautifully, being a Hahannmuell paper, but is very plastic. Of course, this is the only way to do prints with no scratches, fingerprints, etc.....I'm still in the debating mode. I tested this paper as I'm printing very large 40x60 prints and looking for something that can handle this size and shipping around to galleries, without the expense of other mounting options. At that size, things are tough for an artist without going to great expense. It is unlike the old RC papers, those are better I think, but they don't stand up to the fingerprints, scratches etc. I would give it a 5 star for print quality. Rated 5 out of 5 by jen from Really Great paper Very nice paper. Photo lab quality. Reduce bronzing to almost totally gone. Rated 4 out of 5 by Sandra from Excellent All Around Photopape Great paper at an excellent price.